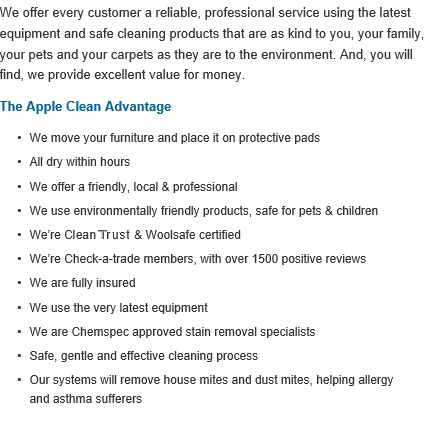 Apple Clean are the Leatherhead carpet, curtain and upholstery cleaning experts. Local for over 25 years, we provide high-quality carpet, curtain and upholstery cleaning services in Leatherhead and across Surrey. For professional domestic and commercial stain removal or carpet, upholstery or in-situ curtain cleaning in Leatherhead, get in touch with Apple Clean for an unbeatable personal service. Hi, I’m Jonathan and for over 25 years I’ve been supplying carpet, curtain and many other cleaning services to homes and businesses in and around Leatherhead. My beliefs have always been that the best way to success with a local business is to offer an exceptional service which is both professional and personal, giving great customer service and achieving excellent results. Give me a call today and I’ll explain what we can do for you and I’ll give you honest and realistic advice. At the same time you can get an instant no-obligation quote. 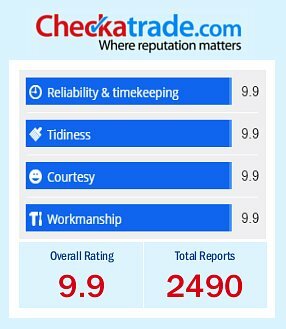 We are very proud members of the Check-a-trade scheme as it enables you to see certified and genuine reviews from past customers in and around Leatherhead. Give us a call us now on 0800 587 4571 to find out more about the cleaning services we provide to homes across Leatherhead and how we can help you. All of the fabric and furniture cleaning services that your property in Leatherhead may require can be covered by the services we provide here at Apple Clean. 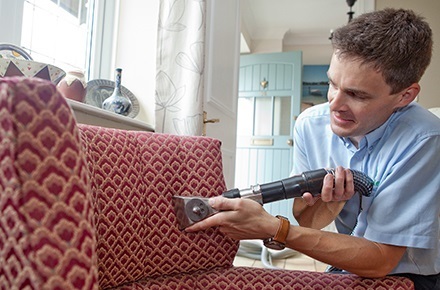 For over 25 years Apple Clean has left clients satisfied with the level of service they have received for their upholstery, rugs, curtains and specialist fabrics. Apple Clean are here to help those in the South East that require a friendly team of cleaning specialists to visit your commercial or domestic property in order to restore your furnishings with the help of expert carpet and in-situ curtain cleaning techniques. In order to make your fabrics look as good as they’ll ever be we take an extremely gentle and precise approach to remove dirt and stains, leaving your property feeling fresh and looking spotless. You can rest assured that the quality of our work is second-to-none and we are able to prove this having assembled a whole host of positive testimonials from our previous clients in the South of the UK. We have managed to satisfy many clients in and near Leatherhead as a result of our specialist cleaning service and we are always on the lookout for more clients to provide cleaning services for in your area. Not only can we offer in-situ curtain cleaning and professional furniture cleaning, we are also able to provide a stain prevention solution known as Scotchgard to keep your fabrics from further dirt collection and stains. This particular service keeps your fabrics looking great even after we’ve visited your Leatherhead property and prevents the need for further stain removal treatment. The care and precision that we maintain with all our clients means that we can ensure the protection of your surrounding furnishings whilst we carry out the stain removal procedure and our friendly cleaning professionals are more than happy to answer any questions you may have regarding the services that we provide. 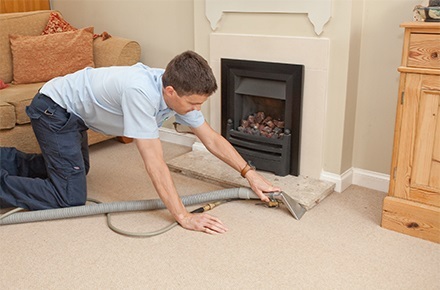 Our carpet cleaning experts are always nearby to Leatherhead offering the best cleaning services in the area! We make the most of the latest cleaning technology to continue providing the best results. We are proud to offer our expert cleaning services for anything from living room curtains to office carpets, so get in touch with us today if you feel your fabrics require our specialist treatment. For a quote, get in touch with Jonathan today.